Download "If we write these equations in ionic form, in each case the net ionic equation is the same; H 3 O + (aq) + OH - (aq) H 2H 2 O(l)"
4 -4-6. Molecular Structure and Acid Strength Size of atom: In size, I>Br>Cl>F, and as acids HI>HBr>HCl>HF. Electronegativity: In general, electronegativity increases from left to right across a period in the Periodic Table, for example F>O. 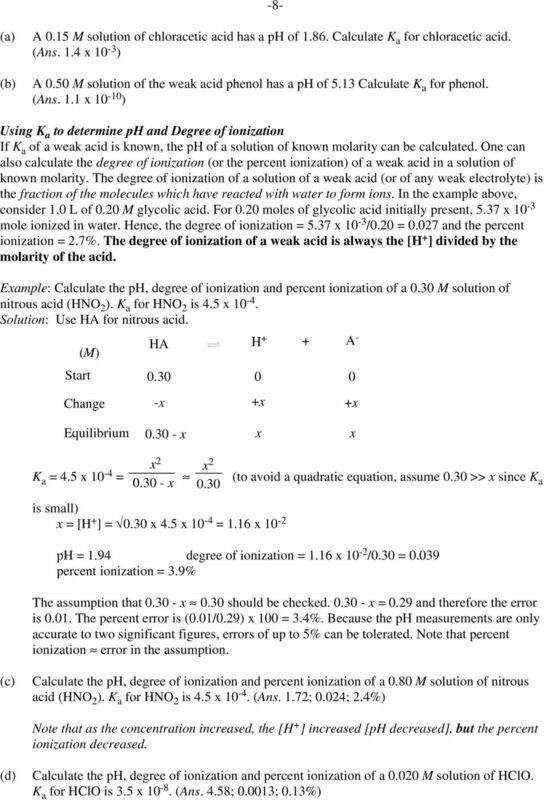 As a result, as acids HF>H 2 O. In general, electronegativity decreases from top to bottom in a group in the Periodic Table, for example F>Cl>Br>I. 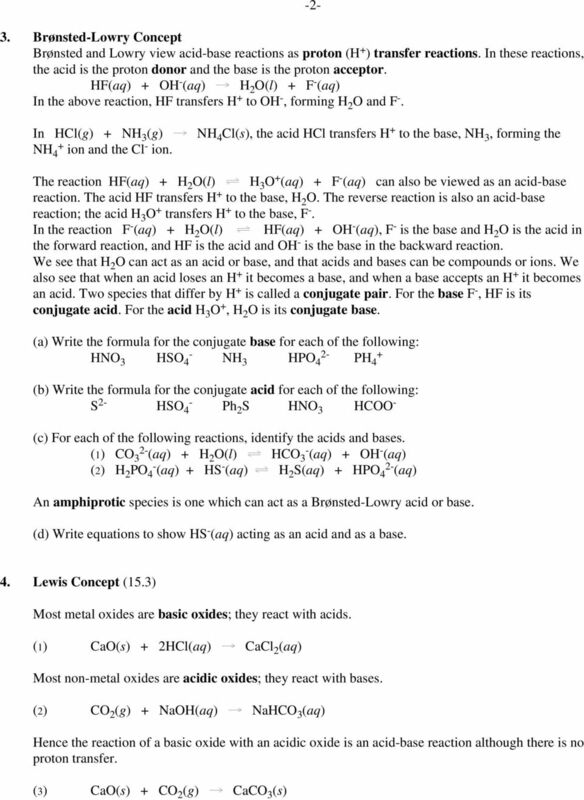 As a result, as acids HOCl>HOBr>HOI. 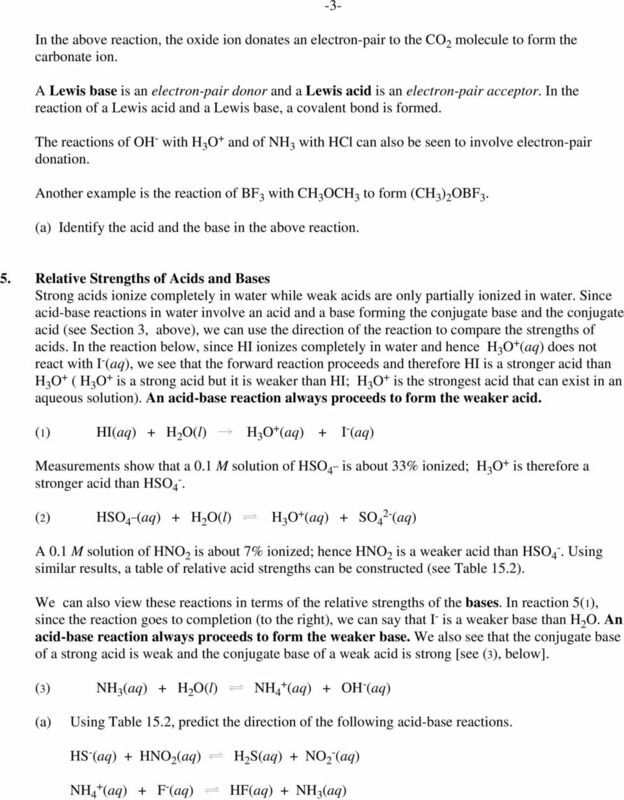 Number of oxygen atoms in oxyacids: The strength increases with the number of oxygen atoms; HClO 4 >HClO 3 >HClO 2 >HClO Not surprisingly, CH 3 SO 3 H is a strong acid (it is stronger than HNO 3 ); it can be viewed as a derivative of H 2 SO 4 in which an OH is replaced by CH 3. 5 -5-7. Self-Ionization of Water H 2 O(l) + H 2 O(l) K H 3 O + (aq) + OH - (aq) [H 3 O + ][OH - ] K c = K c is very small; hence [H 2 O] remains approximately constant. [H 2 O] 2 [H 2 O] 2 K c = [H 3 O + ][OH - ] = constant = K w = ionic product of water K w (also called the ion-product constant of water or the ionization constant of water) has a value of 1.0 x at 25 C and 9.6 x at 60 C. The value of 1.0 x will be used. In pure water, [H 3 O + ] = [OH - ] = 1.0 x Since strong acids and strong bases are 100% ionized in water, [H 3 O + ] in a solution of a strong acid is the molarity of the acid (if molarity of acid >> 1.0 x 10-7 M), and [OH - ] in a solution of a strong base is the molarity of the base multiplied by the number of hydroxide ions in the formula unit. Example: Q. 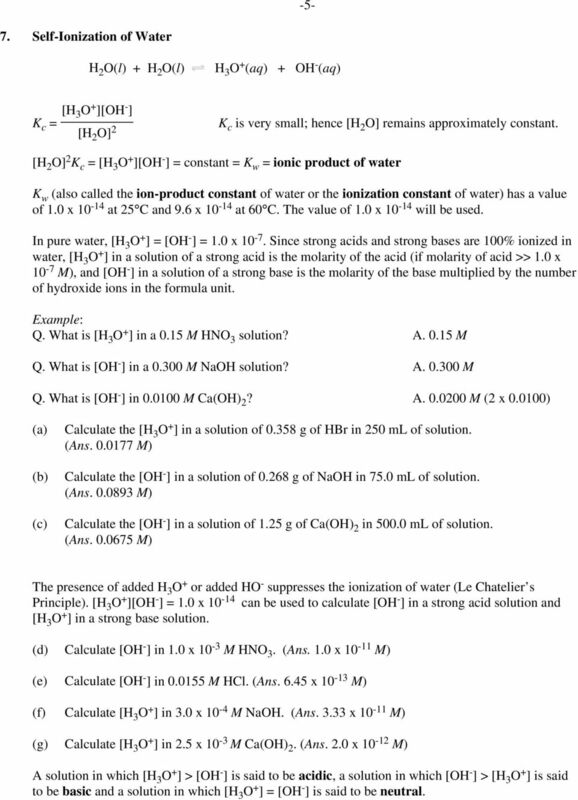 What is [H 3 O + ] in a 0.15 M HNO 3 solution? A M Q. What is [OH - ] in a M NaOH solution? A M Q. What is [OH - ] in M Ca(OH) 2? A M (2 x ) (a) (b) (c) Calculate the [H 3 O + ] in a solution of g of HBr in 250 ml of solution. 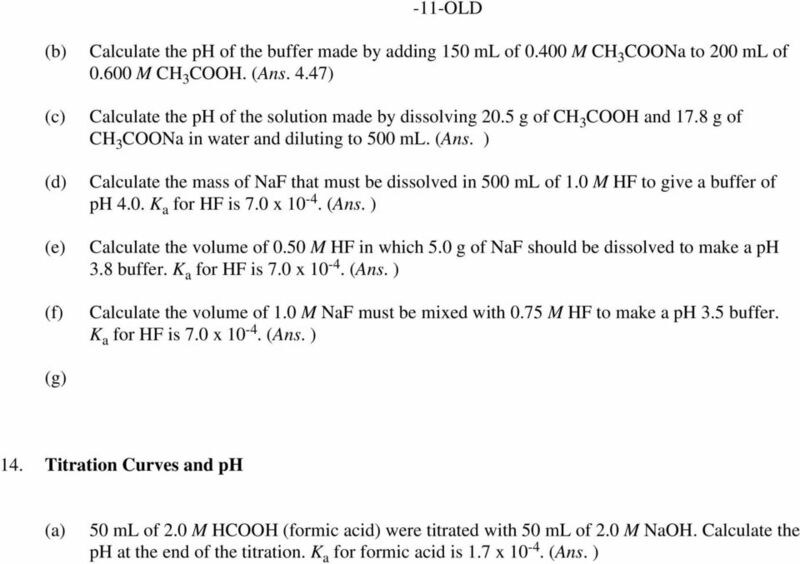 (Ans M) Calculate the [OH - ] in a solution of g of NaOH in 75.0 ml of solution. (Ans M) Calculate the [OH - ] in a solution of 1.25 g of Ca(OH) 2 in ml of solution. 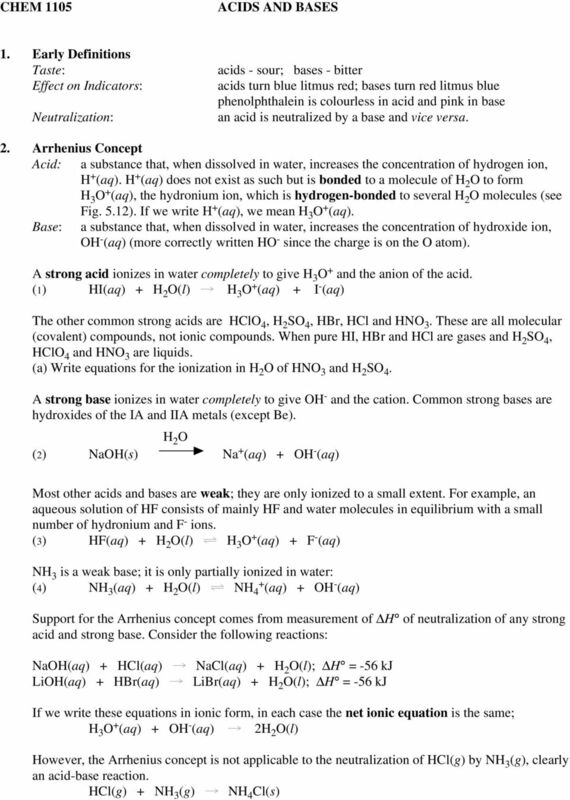 (Ans M) The presence of added H 3 O + or added HO - suppresses the ionization of water (Le Chatelier s Principle). [H 3 O + ][OH - ] = 1.0 x can be used to calculate [OH - ] in a strong acid solution and [H 3 O + ] in a strong base solution. (d) Calculate [OH - ] in 1.0 x 10-3 M HNO 3. (Ans. 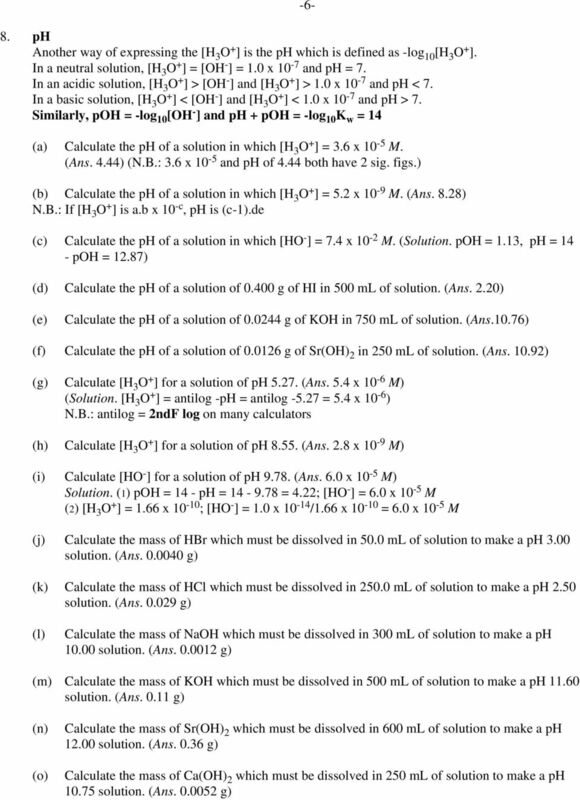 1.0 x M) (e) Calculate [OH - ] in M HCl. 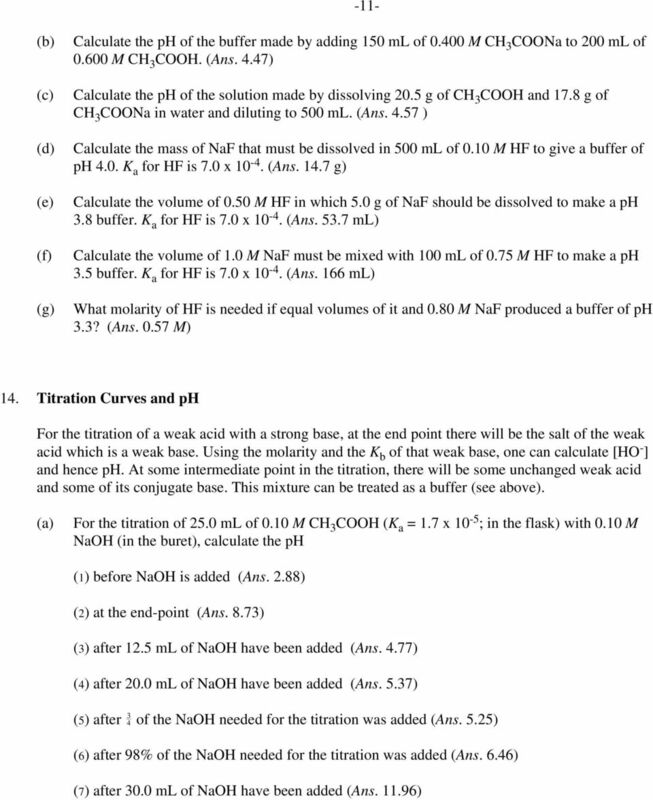 (Ans x M) (f) Calculate [H 3 O + ] in 3.0 x 10-4 M NaOH. (Ans x M) (g) Calculate [H 3 O + ] in 2.5 x 10-3 M Ca(OH) 2. (Ans. 2.0 x M) A solution in which [H 3 O + ] > [OH - ] is said to be acidic, a solution in which [OH - ] > [H 3 O + ] is said to be basic and a solution in which [H 3 O + ] = [OH - ] is said to be neutral. Name: Class: Date: Chapter 13 & 14 Practice Exam Multiple Choice Identify the choice that best completes the statement or answers the question. 1. Acids generally release H 2 gas when they react with a.
Acids and Bases 7. Have You Ever Wondered? Acids and Bases 7 Have You Ever Wondered? 1. Are all acids corrosive? 2. What is an amino acid? 3. Is vitamin C really an acid? Are all vitamins acids? 4. What is the difference between salt and sodium? Acid 7 Base. 1. Describe two things hydrochloric acid does in your body system. 2. What does sodium hydrogencarbonate do in your body system? English already has many collective nouns for fixed, given numbers of objects. Some of the more common collective nouns are shown in Table 7.1. 96 Chapter 7: Calculations with Chemical Formulas and Chemical Reactions Chemical reactions are written showing a few individual atoms or molecules reacting to form a few atoms or molecules of products. You may have heard the word acid used in your everyday life. List some things that this word was describing when you heard it. 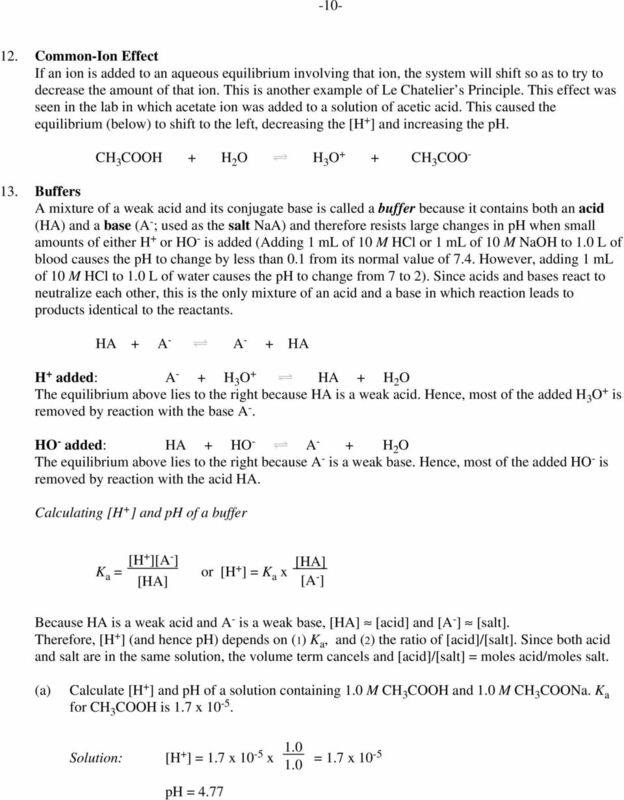 Experiment 9: Acids and Bases Adapted from: Chemistry, Experimental Foundations, 4th Ed. Laboratory Manual, by Merrill, Parry & Bassow. INTDUCTIN T LEWIS ACID-BASE CEMISTY DEINITINS Lewis acids and bases are defined in terms of electron pair transfers. A Lewis base is an electron pair donor, and a Lewis acid is an electron pair acceptor. 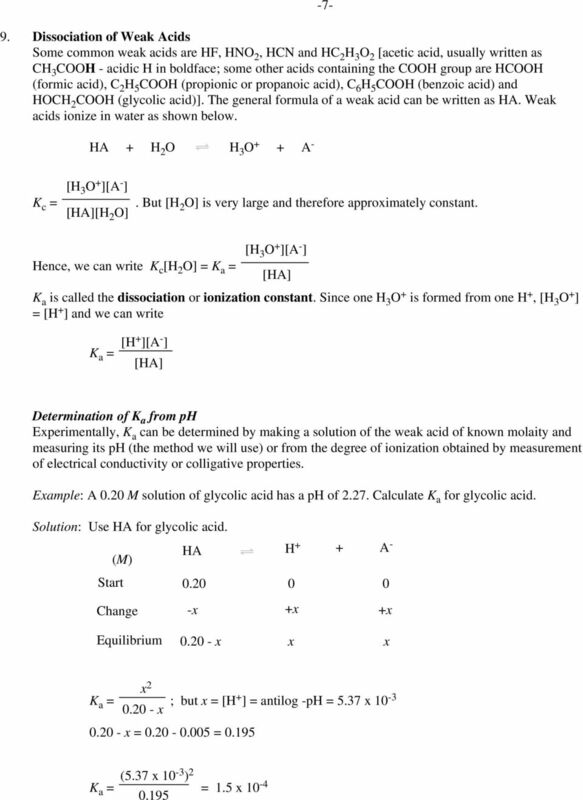 The introduction of your report should be written on the on the topic of the role of indicators on acid base titrations. The energy level diagram for this reaction is shown below. Chemical Bonds. Chemical Bonds. The Nature of Molecules. Energy and Metabolism < < Covalent bonds form when atoms share 2 or more valence electrons. Columbia College Online Campus P a g e 1 CHEM 110 A Chemistry I Early Fall Session (15-51) Monday, August 17 Saturday, October 10, 2015 Course Description Fundamental course in the principles of chemistry. Lesson 2: Understanding expressions of drug amounts All pharmaceutical preparations have some sort of ingredient amount associated with them, which many health care professionals refer to as strength. Unit 11 Practice. Name: Class: Date: Multiple Choice Identify the choice that best completes the statement or answers the question.